During the recent campaign in Israel, Prime Minister Netanyahu promised to annex all the Jewish settlements in the West Bank. If that happens, it will end the possibility of a two-state solution to the Israel-Palestinian conflict. In discussions of the Israel conflict, there are two basic solutions—one state shared by Israelis and Palestinians, or two states for two peoples. Each solution has variants, but there are only two major versions of the one-state proposals. Many Palestinians propose a democratic state with every adult resident having one vote in elections. Over time, that would guarantee a Palestinian majority, eliminating the Jewish identity of the only Jewish-majority country in the world. What are the prospects for a Palestinian-majority ethnically diverse democracy? The Middle East has not had a history of successful democracies. Lebanon had a short-lived democracy before it collapsed into ethnic conflict. Today it is dominated by Hezbollah, which has a powerful, military presence in Lebanon independent of the Lebanese army. Egypt’s democracy was overturned by its military, which outlawed the party that had been democratically elected. Saudi Arabia and the Emirates are dictatorships. Jordan’s king has given significant power to his parliament, but it remains a monarchy, and Palestinians and Syrians in Jordan do not have the right to vote. Syria and Yemen have been overtaken by war in recent years. In short, there is no history of a long-lasting democracy in any Arab country. This reflects a culture in which democracy has not developed significant roots. The division between the Palestinian Authority in the West Bank and Hamas in Gaza is a further indication of the unlikely success of a Palestinian-dominated democracy. What would happen to the Jews in such a country? Would their holy places be desecrated as they were when Jordan controlled Jerusalem? Would they be returned to second-class dhimmi status as Arab countries kept them for centuries, and as Muslim religious leaders often urge? And would the cities built by the Israelis be subject to repatriation into Palestinians’ hands? There is nothing that makes this a plausible solution for Israeli Jews. The Israeli right has a different version of a one-state solution that is being abetted by the rapid expansion of Jewish settlements in the West Bank. In that version, Israeli citizens have the vote and Palestinians living in the West Bank and Gaza do not. Of course, that would not be a true democracy. It would entail continued military control of the Palestinian population, which would have second-class status indefinitely. Palestinians from Gaza and the West Bank would not be allowed free movement throughout the country. If this arrangement became permanent, describing it as a form of apartheid would not be unfair. Each new West Bank settlement and each settlement expansion takes Israel closer to such a permanent arrangement. Continued oppression of Palestinians is a recipe for unrest, resistance and continued terrorism, militarism and death. Furthermore, the continued tensions will move Israel away from its democratic roots by restricting the arts, increasing the difficulty with which opponents of the current government’s policies can visit Israel, and labeling those who disagree with the settlement policy as both anti-Zionist and anti-Semitic. Most Americans and Europeans favor stable political systems that provide equal rights to all citizens, have fair judiciaries, and guarantee freedom of the press, equal ownership rights, and access to adequate housing, education and healthcare. Israel is currently that kind of democracy for its Jewish citizens, but not for Palestinians. The only way to continue to provide such a situation for Israelis and extend it to Palestinians is to create a Palestinian state. For that state to become successful, it will need an adequate capacity to import and export, access to sufficient water, and an infusion of aid sufficient to build an economy large enough to support the residents of the new country. Following the end of World War II, the United States launched the Marshall plan, which was essential to rebuilding Western Europe in general and West Germany in particular. Creating prosperity and a reasonable level of employment was key to the stabilization of Europe. One cannot understand the chaos in Gaza today without factoring in the fact that following Israel’s withdrawal, few of the economic measures needed to stabilize Gaza were in place. As we consider the possibility of the two-state solution, building in measures that will create a reasonable level of employment and economic stability in the Palestinian state is a critical part of what will be needed to build a new nation with the capacity to thrive. The current policy of the Trump administration, which endorsed annexation of the Golan Heights, supports settlement expansion and treats Palestinians as second-class non-Westerners, has the result of supporting the one-state solution that will lead to apartheid. This is a violation of fundamental American values, and serves no other positive policy agenda. Americans with a commitment to fair play should be lobbying in Washington for support for a two-state solution and all the measures needed to bring it about and make it successful. Note: This essay was first published on Evolve: Groundbreaking Jewish Conversations. Rabbi Teutsch is a senior consultant to the Center for Jewish Ethics and Wiener Professor Emeritus at the Reconstructionist Rabbinical College, where he previously served as president. He is the author an award-winning three-volume Guide to Jewish Practice as well as dozens of other books and articles. 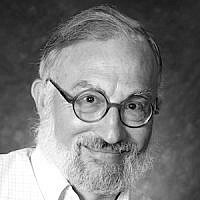 He is a past president of the Society of Jewish Ethics and the Academic Coalition for Jewish Bioethics. He is a cochair of the JStreet Rabbinic and Cantorial Cabinet.